Another frustration with this book is the rather disjointed way that the complete recipe for a pie is assembled: crust recipe at the back of the book, except some of the procedure at the front of the book, topping recipe at the back of the book, filling recipe in the middle, with much place-marking and flipping back and forth to find all of the details of the ingredients and procedure. Perhaps if one is both an experienced pie baker and accustomed to the particular recipes in this collection it might be easier to use, but for a first-time user it can be quite daunting to discover, as I did, that the pie plate was supposed to be buttered, that an egg-white glaze was needed when blind-baking the crust, and that pastry flour was specifically not recommended to use in the Elsens’ crust recipes. (Oh well, too late now.) That said, I was able to successfully complete the recipe, and I have the pictures to prove it. 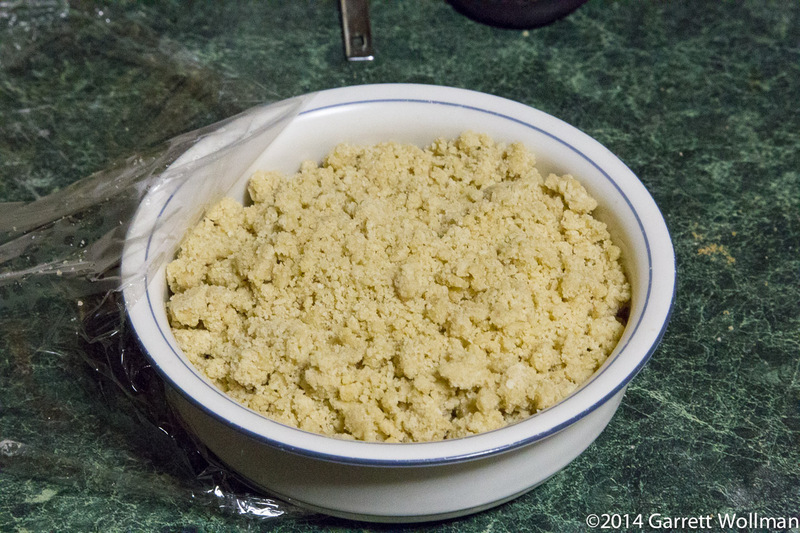 The streusel, like the pie dough, was prepared the day before and refrigerated. 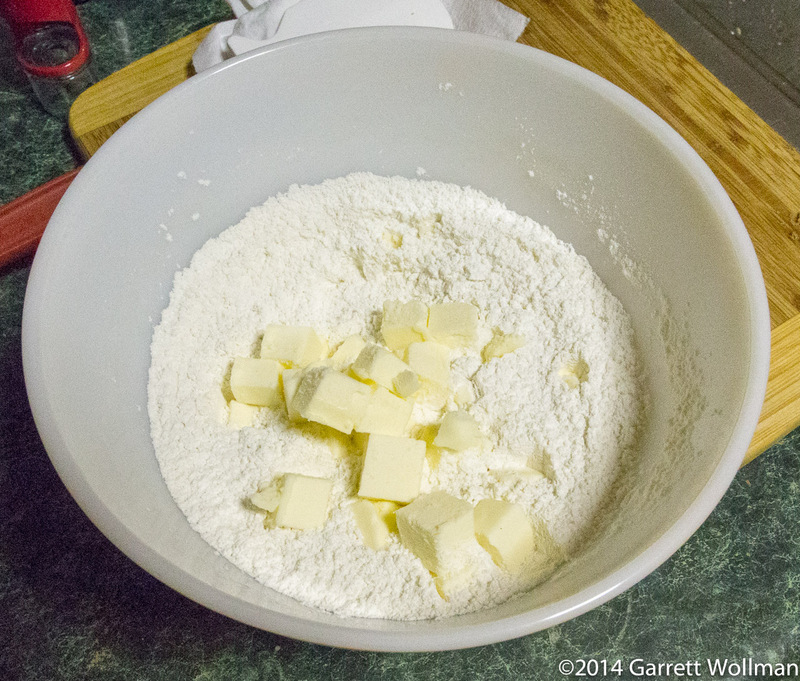 Cold cubed butter is added to a mixture of flour, sugar, and salt to make pie dough. 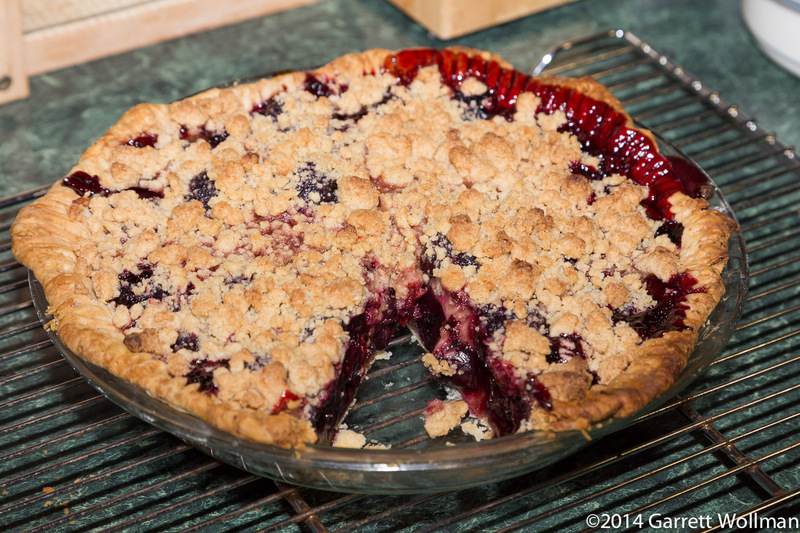 The Elsens advise using a pastry blender to make the pie dough. I can’t agree, but I followed their instructions anyway, to the extent that I could. 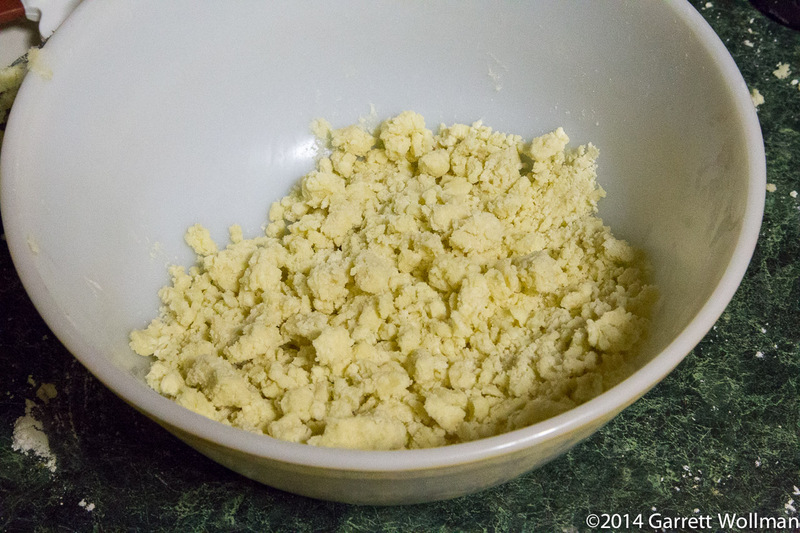 The butter-flour mixture made an unmanageable mass on the pastry blender, leaving me with no idea when “mostly pea-sized pieces of butter remain”. Next time, I’ll be using the food processor. Pastry must rest for some time in the refrigerator. This serves two purposes: first, it allows the butterfat to resolidify, and second, it gives the flour time to completely absorb the liquid. Excessive handling at this stage can develop gluten, resulting in a tough crust. I probably managed that. The following day, I rolled out the dough in accordance with the Elsens’ directions, and fit it into a nine-inch Pyrex pie plate. I eschewed the fancy hand-crimped edge treatment they suggest in favor of a simpler fork-crimped edge. 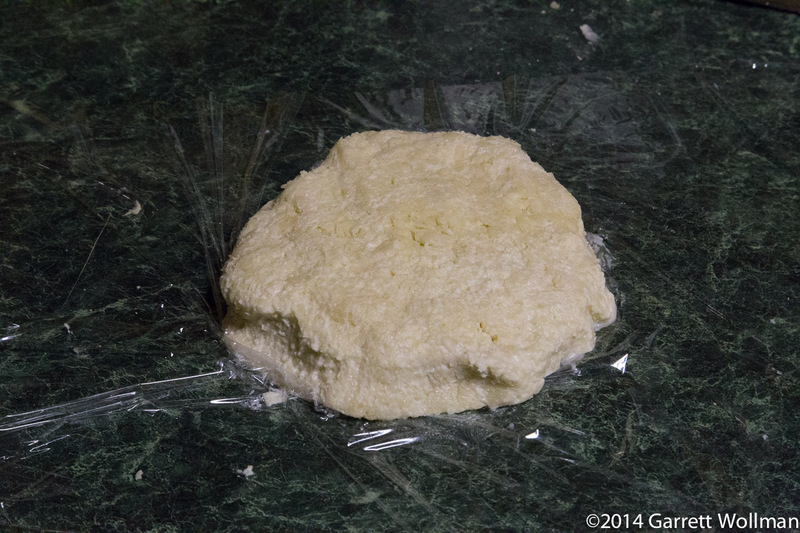 The crust has to go back in the fridge to resolidify after all that handling. 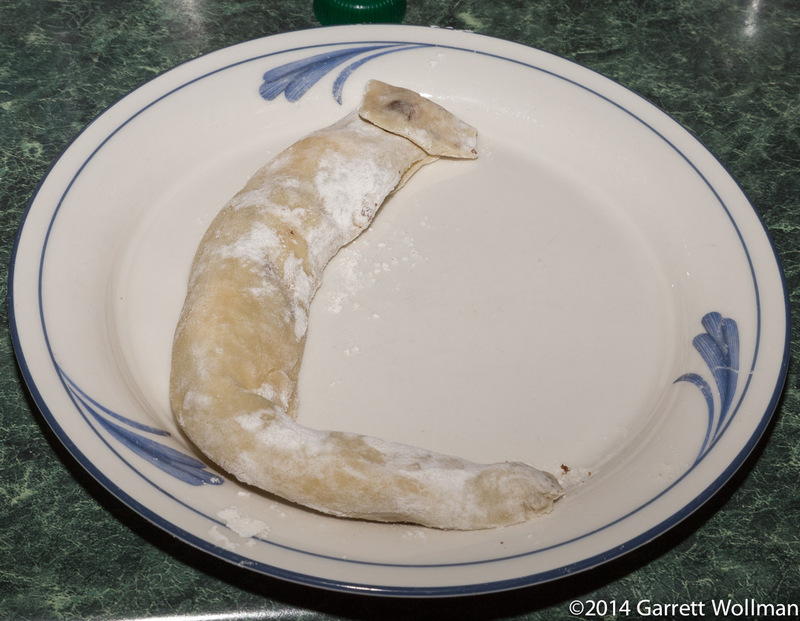 My grandmother makes cinnamon-sugar pastry treats out of leftover pie dough. I didn’t have enough dough to do it like she does (I think she makes extra dough intentionally!) but I mixed some cassia and brown sugar together and rolled it up in a scrap of pastry like this. Then 15 minutes in the oven and yum! 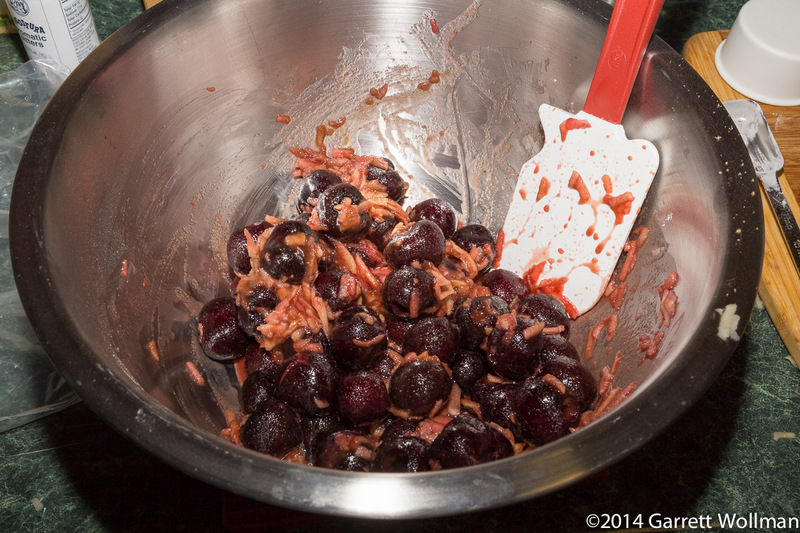 While waiting for the crust to solidify, I got to work on the cherries — first figuring out how many I actually needed, and then the simple but tedious and messy process of pitting them. I am notoriously awful at estimating volumes by eye, so I bought about three times as many cherries as necessary — the Elsens, somewhat inconsiderately, specified only “5 cups” as the quantity, and I don’t know anyone who sells fresh fruit by the cup. 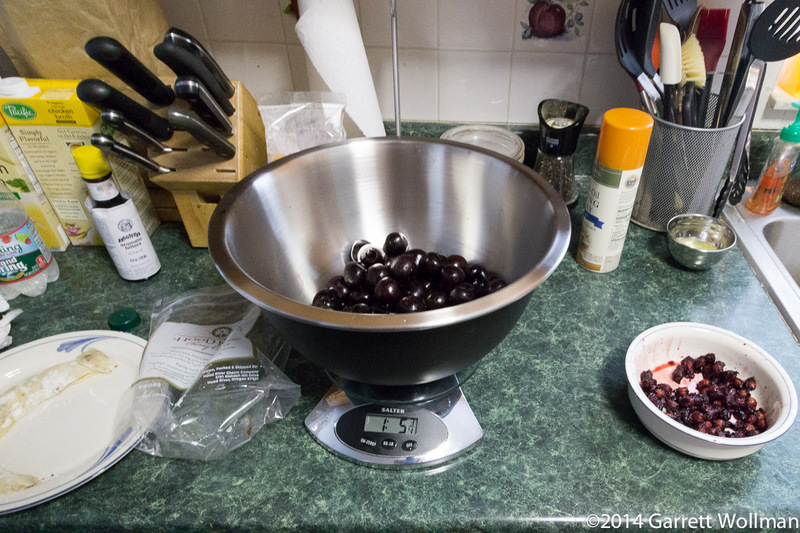 The actual measurement was a pound and a half, or 55 individual cherries; after pitting, as shown on the scale here, they weighed about 22 ounces. 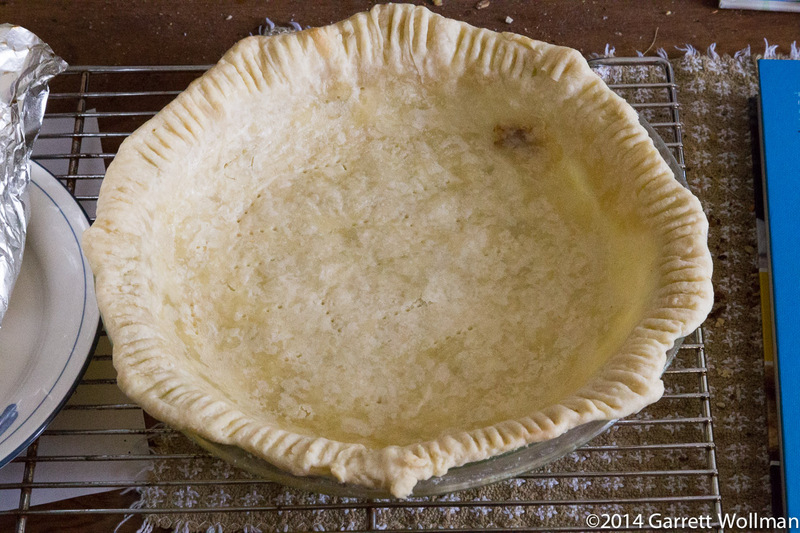 As with most fruit pies, the crust must be par-cooked (“blind baked”), both to set the shape of the dough (otherwise it would slump) and to ensure that it cooks completely (as the wet fruit filling would otherwise keep it from getting hot enough). At the kitchen store you can buy fancy metal or ceramic pie weights to use when blind baking your crust. 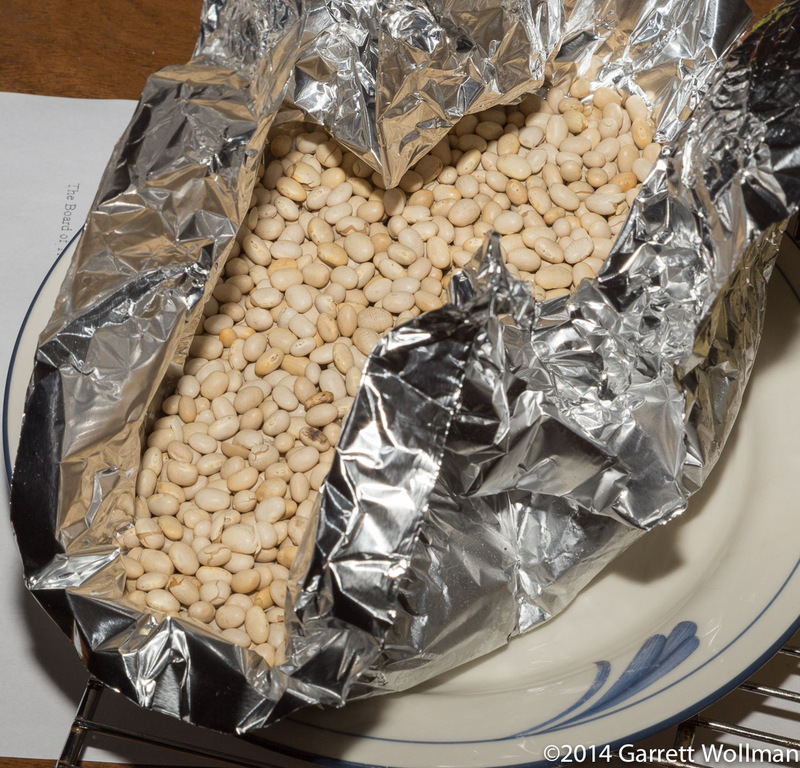 Or you can go to the supermarket and buy a pound of beans for a buck or two. Guess which option I prefer! 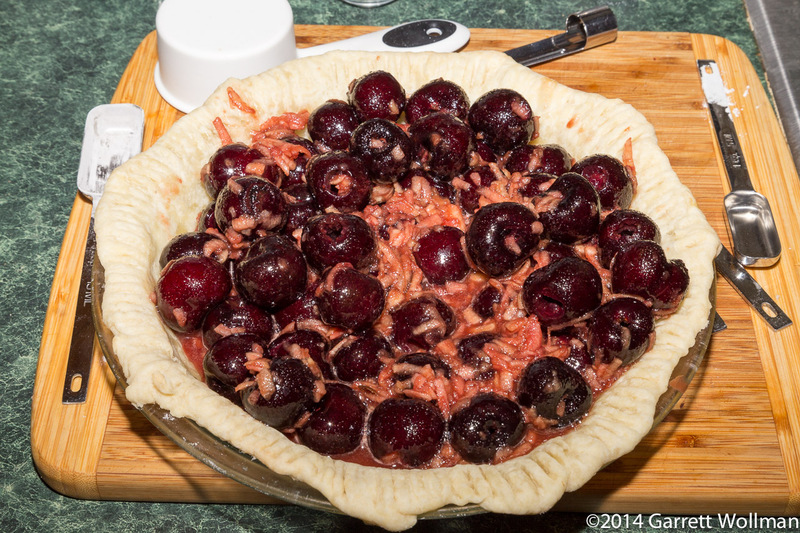 In addition to the pitted cherries, the pie filling also contains a great deal of brown sugar, starch, and a shredded apple, all of which contribute to the gelling of the filling. (The apple contributes pectin but is otherwise not noticeable in the baked pie.) The Elsens’ recipe also includes a couple dashes of Angostura bitters, although I suspect you’d have to run a side-by-side blind tasting to tell what difference it makes. 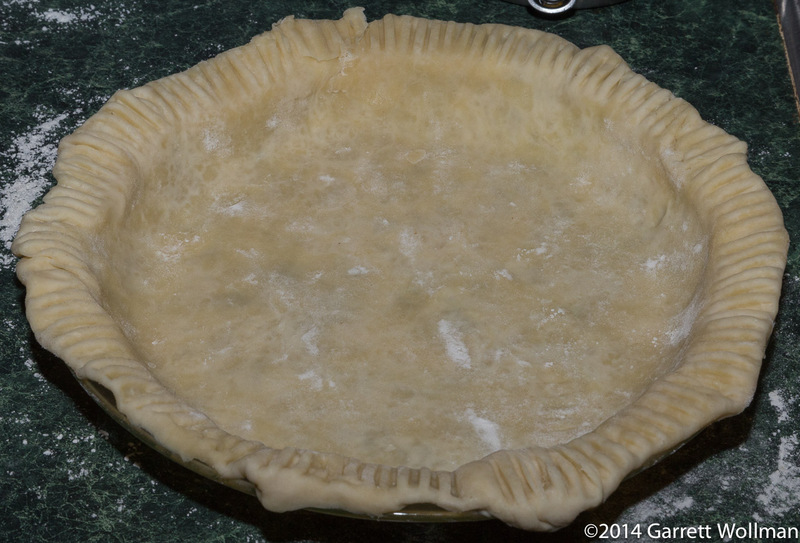 After the pie crust cooled completely, it was time to fill it. My cherries were so big that it was difficult to fill it evenly — every time I moved some of the filling into a hole on one side, another hole opened up on the other. 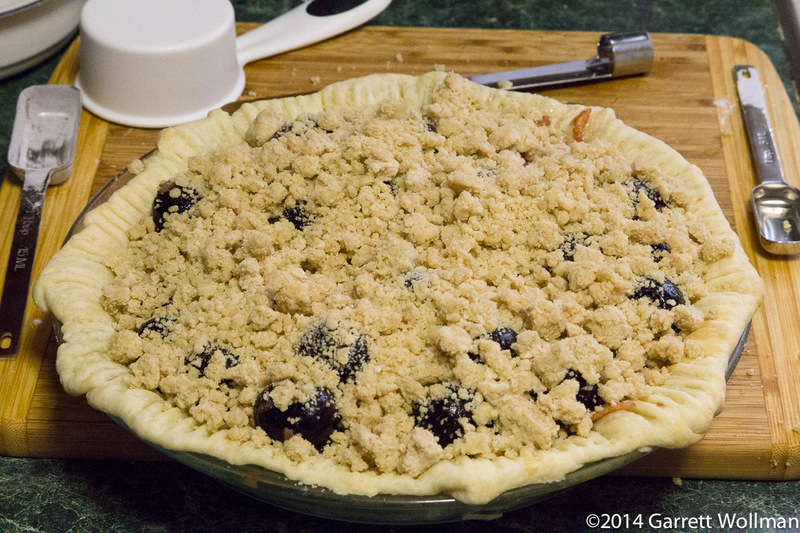 Thankfully, the streusel topping is quite forgiving and will cover up any obvious voids in the pie filling. My oven is probably not precisely level, allowing a small amount of filling to escape on one side. Despite my misshapen crust, it turned out pretty well, I think. Maybe if I make this again I’ll use a tart pan. Pie in general is not exactly light, calorie-wise, but since I was having a low-fat, relatively low-calorie soup for dinner, I could afford to have a full slice (1/8 of the pie), and it was good. So, um, I neglected to take a picture of my actual slice of pie, but I did remember to get a picture of the pie with a slice removed! 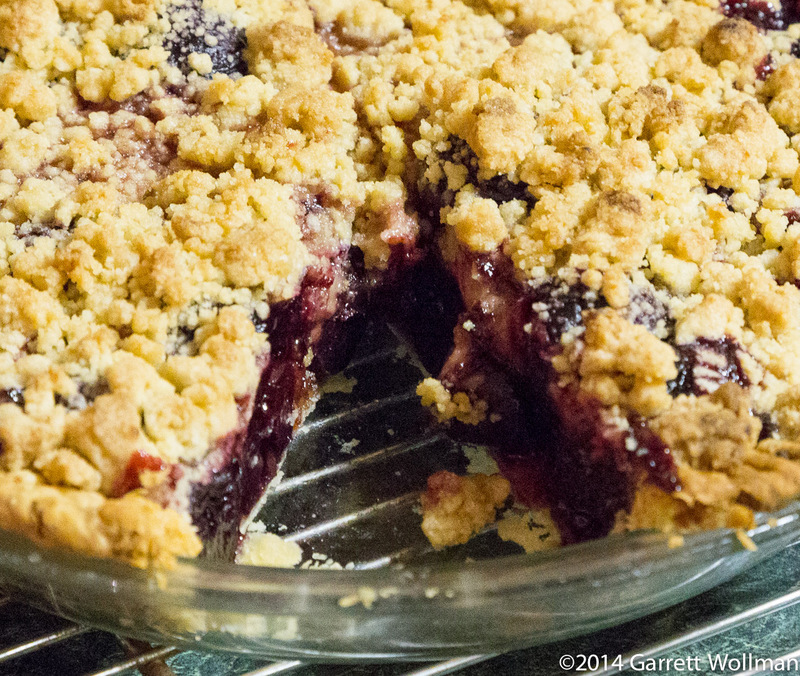 Here’s a closeup of the pie with a slice taken out. Look at how solidly the filling has gelled after having cooled for a few hours! Well, pie is definitely not a light dessert — I’ve had cakes that are lower-calorie than a slice of this pie, and even a good chocolate bar is going to lighter per serving by quite a large degree. But it’s not terrible, either, and there’s a lot of good fruit in this one. 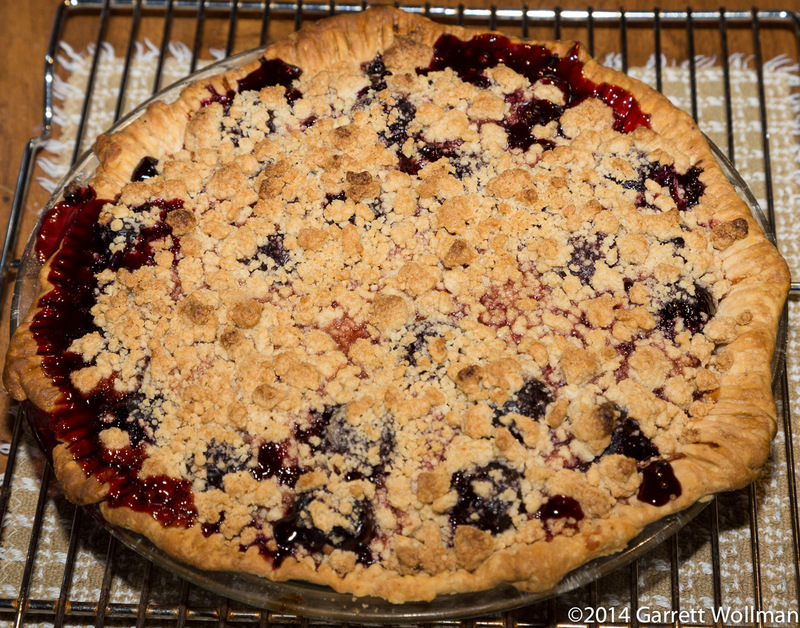 Gallery | This entry was posted in Food and tagged cherry pie, Four & Twenty Blackbirds, fruit pie, pie, recipe. Bookmark the permalink.